Although he predicates this blessing on being “outside the walls” and on the “split- / infinitive of to love,” voices join together to sing. The Question Factory: why do you smile? Because I still have my teeth . . .
: why do you laugh? Behind the joking answers to this mock-interrogation, Metres and the “future brother” silently remind us of those who have endured other interrogations and do not still have their teeth or their tongues. The Question Factory asks: what is a dunum? Throughout a Concordance, the speaker must negotiate interpersonal exchanges, not only with his new brother-in-law but also with border guards, taxi drivers, and more. He does so through an American’s cultural lens—“Rami, sunglassed cabbie born in al-Quds, dead ringer / for Travolta circa Saturday Night Fever”—while simultaneously internalizing those he meets like Muhammed, who “spent a month his head buried in burlap” for “throwing a Molotov at a bus” and Muhammed’s wife, who has just given birth to “Carmel, which means ‘God’s Vineyard’”; and, for the brief moment of their appearance, the speaker allows himself to become them, both giving his sister away to her new husband and giving himself away to the experience, to a future. 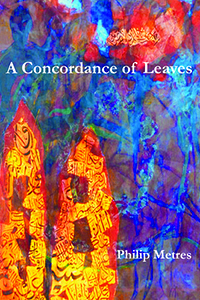 In spite of the danger, A Concordance of Leaves allows this marriage to represent the tentative hope of the region. Although the book serves as a blessing to send the new couple out and into their new lives, it also encourages Metres’s thoughtful examination of his relationship to the region and his own identity. Philip Metres is the author of several chapbooks, including A Concordance of Leaves (Diode Editions, 2013) and abu ghraib arias (Flying Guillotine Press, 2011). He is the author of the collection To See the Earth (Cleveland State University Poetry Center, 2008) and several works of translation.